Soma Cumaranatunga was born on June 16, 1915, in the village of Katukurunda eight miles from the city of Galle. She was the Principal of Mahamaya Girls College, Kandy, from 1951 to 1972. Mahamaya Girls' College was founded in 1932 as a private fee levying school by the Sadachara Bauddha Kulagana Samithiya -a society of women activists led by two women Sarah Soysa from the Southern Province and Chitravo Ratwatte from the Kandyan aristocracy. Their purpose was to provide an English education, along with some social accomplishments, for Buddhist girls in Kandy and the outlying provinces, while at the same time imparting a education in Buddhism and the Buddhist way of life- an education that was different from that provided by the available Christian missionary girls 'schools of the period. However, Soma went beyond the aims of the original founders. She reoriented the school, to produce students to compete academically, as well as in sports and aesthetics, with students of the best educational institutions in the country. Preparing students to enter university or to qualify in other professions became the primary goal, which Soma achieved with single minded commitment and hard work. Soma came from a family of educationists and scholars and Buddhist activists. Soma's uncle was Munidasa Cumaranatunga, the famous Sinhalese scholar, grammararian, linguist, writer and poet. Soma studied up to the fifth standard at Koggala Katukurunda Dharmika Vidyalaya, a vernacular Buddhist school. In the late 1920s she joined The Sacred Heart Convent in Galle. 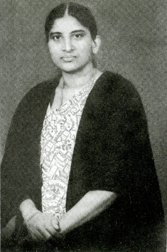 In the late 1930s Soma entered a collegiate school in Galle to prepare for her London Degree Examination. She specialized in Sinhala, with Pali as her subsidiary subject and was awarded First Class honours for her degree from the University of London. The nuns of Sacred Heart Convent were happy to welcome Soma as a teacher. It is likely that she learned the discipline and professionalism that she later displayed at Mahamaya from these nuns who had a tradition of teaching and administrative experience. Soma joined Visakha Vidyalaya in Colombo in the mid 1940s . On 6th May 1948 Soma moved to Kandy when she married her kinsmen Lionel Pujitha Goonawardene, who was an inspector of the Sri Lanka Police. The Department of Education appointed her to the school inspectorate of Kandy and Soma came in contact with Mahamaya College. N.E. Weerasooriya, an eminent lawyer and Chairman of the Board of Trustees of Mahamaya College persuaded Soma Goonawardene to accept the post of Principal of the school on 1st May 1951. At the time of her appointment as Principal, Mahamaya was classified as a Grade 3 school. Soma immediately set in motion remedial measures. Many of her pupils will remember Soma Goonawardene as a strong disciplinarian. In fact, Soma Goonawardene looked at the school and its pupils very much as a General surveys a battlefield to assess the chances of success. Not only by precept, but by example she enforced discipline among students and staff. She was the first to step into school early morning and the last to leave it in the evening. Soma Pujitha Goonawardene was an imposing woman, tall, handsome, neatly and smartly dressed in a sari. Often a fleeting appearance by the Principal was sufficient to enforce discipline. In the 1950s, C.W.W. Kannangara's far reaching educational reforms brought within the reach of the even less privileged students , through the Central Schools that were opened in the provinces, an English medium education styled on the public school curriculum of England offering an academic education oriented for university entry with support for sport activities, and aesthetics. Therefore, Mahamaya needed to offer science education, and to enhance English language abilities of the students, and also to upgrade sports and extra -curricular activities in the school. Many measures were taken to improve the standard of English in the school. The English Literary Association was revived. Prepared speeches, impromptu speeches and debates with other schools, recitation of poetry and reading of prose passages were all activities promoted. Soma Goonawardene considered the appreciation of English and Western culture an important adjunct to learning English. In 1951 when Soma Goonawardene took over as Principal of the school Mahamaya College did not teach chemistry, physics or zoology although botany was in the school curriculum. Therefore, Soma made provisional arrangements in July 1952 to teach science and constructed and equipped a science laboratory. She recruited Puwaneswarie Ranganathan, an Indian university graduate to teach four subjects - Physics, Chemistry, Botany and Zoology. The one laboratory had very limited facilities not sufficient to teach science effectively. Money was necessary for the building of laboratories, purchasing of equipment and recruiting of qualified teachers. Soma Goonawardene took upon herself the task of raising the much-needed funds for this venture. With the cooperation of teachers and well- wishers, she organized a carnival in 1952 in partnership with Dharmaraja College, and in the following year with both Dharmaraja College and Vidyartha College, and they proved financial successes. Mahamaya College, was a fee levying assisted school receiving a government grant like the missionary schools. The school therefore did not receive government financial assistance to launch into science education like state schools of today. From about the end of 1960s the school performed consistently well in science at the GCE O Level and A Level Examinations and in some years achieved the best results among schools in the Central Province. In 1957 Soma appointed Manel de Silva, an Indian trained teacher as the Sports Advisor. While improving netball and athletics Manel introduced basketball, badminton, tennis and table tennis. The girls went on to win All Island Championships in Athletics, Basket Ball, Badminton, Tennis, and Table Tennis. Mahamaya Girls were also able to represent Sri Lanka in International Meets. With Soma at the helm, Mahamaya became a highly rated academic institution by the 1960s. She was often asked how it was possible for the school to achieve such unprecedented success in a very short period of time, and with characteristic generosity she always attributed it to the hard work and commitment of her teachers. In 1972 at 57 years of age when she retired as Principal, Soma was able to look back with pride and satisfaction at the realization of her dream. Mahamaya College had become one of the most sought after schools in the country Soma's work became the standard against which the work and achievement of all succeeding Principals was measured.